Although Express Water did not back their claims with certifications on how well their filters perform, it receive quite a higher ratings from it existing customer. Quality are solid and installation is relatively easy. To reduce the cost, the parts are not made in US. 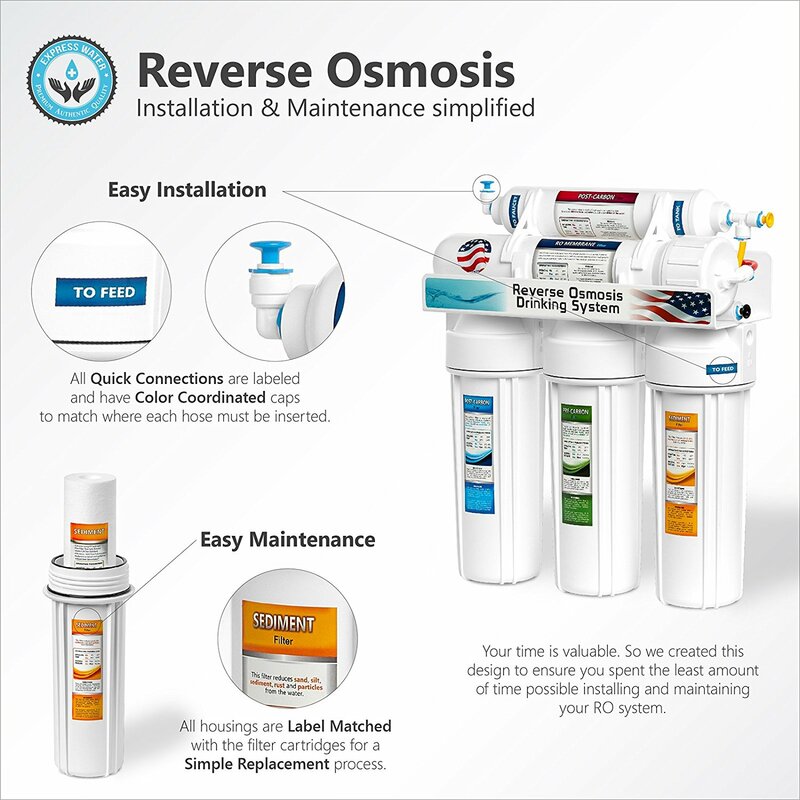 They lower down the entry level of a reverse osmosis system and made it affordable to the public. It is RECOMMENDED if you have limited budget and it is the cheapest entry model for reverse osmosis system. Express Water might not be as well known as APEC and iSpring, but they have been in the industry for 25+ years. Their specialities are reverse osmosis system. One of the best thing about Express Water is the affordability of their 5 stage water filter. With a low price tag, is it a problem when it comes to performance? Let’s find out. 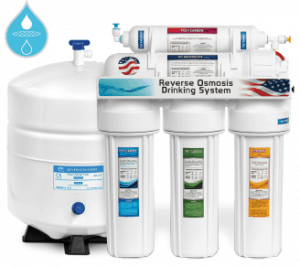 Remove 99% TDS: Similar to most of the reverse osmosis filtration company, Express Water claims that the RO5DX is capable of removing 99% of major water contamination such as lead, fluoride, pesticide, bacteria and etc. Simplified Installation Process: Express Water claims to have simplified the installation process which most of the customer agreed that it is pretty easy to install. Rigorous Testing: They have done several rigorous test on leaking, durability and resistance on all the systems to ensure the quality of the product. Manufacture in Taiwan: One of the reason it’s lower in cost is because the parts are produced in Taiwan instead of US. Well, it is still better than products made in China. No Certification: As for 2017, there is no certification or a full list of contamination that was provided to back their claims. Frequent filter replacement : To maintain the quality of the water, it needs a replacement every 6 months. This translate to high replacement cost for the Express Water filters system. Below are the summarize technical specification that you should know before buying the Express Water Reverse Osmosis RO5DX System. Capacity: 50 gallons per day. 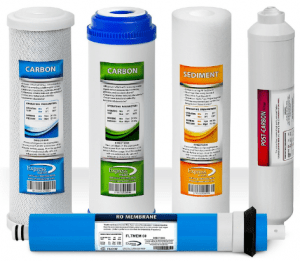 The Express Water RO5DX was advertised as a 5 stage water filters which consists of the following. Stage 1: 5 micron poly-proplene sediment filter – Removes sand, rust, dust and other sediments that can be seen by naked eye. Stage 2 & 3: 5 micron activated carbon and carbon block – Removes odor and taste of chlorine, cloudiness, VOC and organic chemicals that is in the tap water. Stage 4: Reverse Osmosis Membrane – Removes bacteria, pesticide, viruses as well as decreasing the total dissolved solid in the system. Stage 5: Post Carbon Filter – Stabilize the water taste and remove further odor after the water comes out from the storage tank. Express Water claims that their filters are up to the standards of NSF and industry regulations. They are tested and verified by independent laboratory. Express Water claimed that the installation is easy with the color caps and quick connectors. However, it is more or less similar on installing the faucets and drain pipes compared to other reverse osmosis models. The installation process suggested to be 2-3 hours. Some of the existing owners are able to achieve it in an hour. It’s all depending on the plumbing experience. Compared to APEC ROES-50, the filter life is halved. According to their website, the replacement cost will be around $50 yearly if you purchase the 2 years package, or else it will cost $70 for one year package. However, cartridges are selling cheaper in Amazon compared to the main seller’s website. You can get a great deal of less than $100 with 3 years of filter supply excluding the RO membrane. The Voice From Existing Owners…. Express Water receive relatively good review in Amazon from the existing owners. Some great comments on the product that were left by the existing owners. + Water coming out at 35ppm and dropping instead of the 500+ppm from tap. + Ice went from cloudy to nearly completely crystal clear. + The quality of our water improved greatly.. Affordability: This product is the cheapest among all reverse osmosis water filter system and the replacement cost is low too. Reduce TDS: Although it is low in price, it performs fairly well in removing the TDS. But it would need to constantly replace the filters. *Good News: Express Water is currently giving out free 1 year supply of filter cartridge for every purchase of this unit. You will save $69.99 today! What a fantastic website you have created here! Clean water is a must have isn’t it! Especially when we hear the conspiracies about fluoride and how it’s poisoning us. 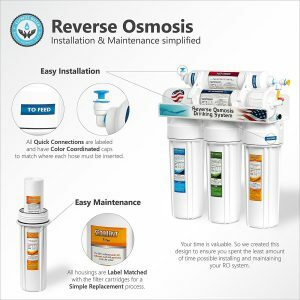 I have looked into reverse osmosis in the past but these post + website is so detailed and helpful. You are welcome. Hope this helps you to choose a better system. I was worried about how often I was going to have to change filters. Then I get to the end of the post and find out that if I purchased this unit, that I would get a year’s free supply of filters. Yes, It is indeed a great deal. But the filtration functionality is not backed by any certification or confirmation on residual removal. Love the site!! I am just really diving into water filters and your site is a wealth of info. I would love to stay connected and possibly interview you for my site “Big Family Preparedness” on water filters, how they work, which is best, etc. Let’s stay connected!